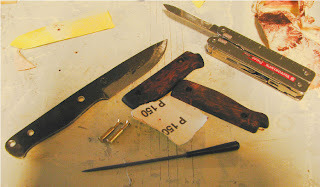 Perkele´s Blog: Dug out an old project blade. Dug out an old project blade. 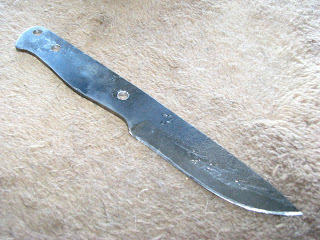 I dug out,from my bin,my dusty treasure chest,this blade taht i made some...maybe 7 months ago,and got an inspiration to work on it at home and in schools crafts shop & dorm,so i got it into hardness of 58 HRC and softer on spine,fabricated a stamp with dremel mini drill & small diamond bit on it,to get good looking ( ? ) 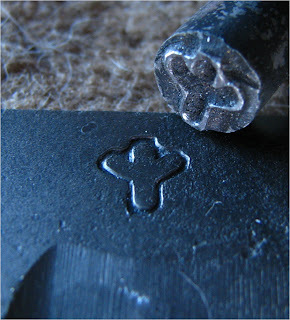 stamp on it.I added some small filework on spine,for thumb,and sharpened the spine for using it on firesteels. I then sawed ,drilled and filed,ground and sanded the handle slabs,from curly birch,that i dyed with oak & dark brown,then oiled it,and then i just made the brass fastening hardware form cheap furniture screws and counterparts,shortened them to fit,and polished the ends just a bit,and made those bit more flat / low profiled.Added some epoxy and assembled the damn thing. Then i sharpened the blade,and its still waiting for final touch of sharpness,thht i will perform when i get to home where i have my sharpening kit. 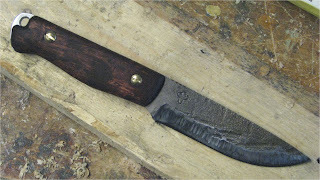 I also made a firesteel to match the knife,from leftover piece of the same dyed wood that i used for handles. 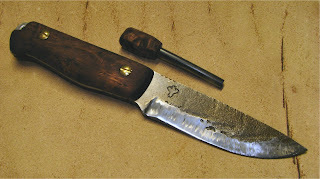 Now,when i have time and will,ill be making the sheath for this "kit".